Every two years we organise a World Homeshare Congress to bring homeshare practitioners, policy makers and researchers together to share ideas, learn from each other and establish links. These meetings are particularly helpful for new programmes – and have even inspired people to set up a programme where none existed before. The papers from these congresses can be found on our website and make up a valuable resource for anyone wanting to know how to set up or manage a programme, how to evaluate programmes and much more. So far we’ve hosted five congresses: Paris (2009), Cologne (2011), Oxford (2013), Melbourne (2015) and Madrid (2017). 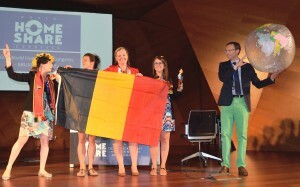 At our Spanish congress the giant globe was handed on to our Belgian colleagues from 1 Toit 2 Ages who will host the Sixth World Homeshare Congress in Brussels on 21 and 22 March 2019. Save the date and read more about the plans!